Technique Tuesday- Happy Virtual Birthday – 20% off your entire order!! Hey friends and Happy Virtual Birthday from Technique Tuesday! There is a special once a year offer for 20% off going at Technique Tuesday through midnight Sunday March 24th PST! I have created few funny birthday cards for this special event and am sharing them below. First I created a set of CAS cards with several images from the stamp set and a funny sentiment. If you have a friend or a family member that loves a good laugh any of these cards would make their day. They are simple and easy to make and will bring a good chuckle. I colored these with watercolor pens directly on the card base. For my second card I decided to do some paper piecing. I stamped each of the shirts on some vintage patterned papaer I had in my stash and fussy cut them out then adhered them to a piece of distressed kraft cardstock. Sentiments were white heat embossed and adhered with foam tape. I laughed at this last card when I was making it and I hope it will bring a smile to your face as well. 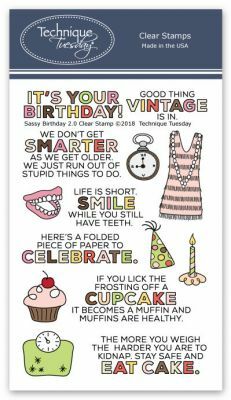 I hope this post gave you a chuckle and some inspiration to create some funny birthday cards! Don’t forget to use coupon code HB2019 at the checkout for 20% discount of your entire order! I wish you a blessed Sunday and happy shopping!